Cryptopia is a New Zealand exchange that remains a work in progress, both in terms of trader support, coin offerings and trading capabilities. It’s also a target for scams, something all the coins in the world can’t fix. The Cryptopia exchange enables two-factor authentication during the registration process, which is a plus for security. Whether you can trust your funds here depends on if they’re putting the right security measures in place to combat the threat of a breach, which is something we’re going to explore. At the very least, the exchange appears to be a target of hackers whether or not those scams are successful. In Q1 2018, users were reporting failed attempted log-ins to their Cryptopia accounts. To say that Cryptopia is finding its footing is an understatement. If you didn’t need to contact support for any reason, the exchange would run swimmingly. But there are wallet issues involving funds becoming stuck that are exacerbated by what’s largely been inadequate customer support. On the plus side, the exchange has gone from only a handful of coins and weak trading volume to now offering a wider selection, which based on an increase in trading volume has pleased investors. According to Coin Market Cap, Cryptopia supports trading in nearly 500 coins and trading pairs. It’s 24-hour volume for a 24-hour period in March 2018 was USD 7.6 million. Booth says they lost some ground amid a plethora of new users that the platform couldn’t handle. Meanwhile, Cryptopia also operates a mining pool, which is kind of a smart feature of an exchange to offer. Apparently, users can mine directly to their Cryptopia wallet. But this has triggered some issues and delays with certain wallets associated with specific coins, most notably ETN wallet code originating from Monero that proved insufficient to handle the volume of transactions in this coin on the Cryptopia platform. As a result, investors were unable to access their ETN until the wallet was no longer in maintenance mode. Charting tools with features such as candlestick and volume. 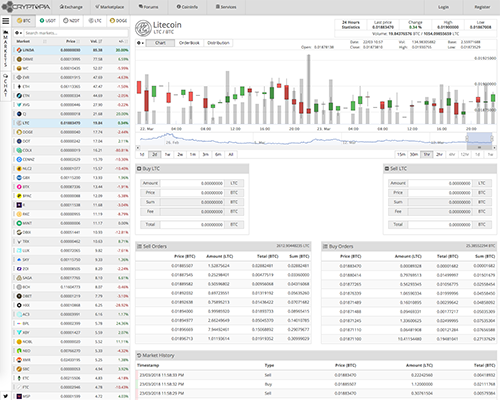 Users can also view real-time price, high/low, etc. Customize the chart duration. Users can also see the ratio of buyers to sellers of a certain coin. Multiple coins and trading pairs for traders to choose from. Cryptopia supports some of the newer coins that other exchanges don’t yet offer. Users tout gaining access to altcoins on Cryptopia that they can’t access on Bittrex or Binance, for instance. High-tech trading interface that’s been vastly improved from a previous version. They launched a help center in March 2018 to deal with customer issues, which was a long time coming but is a sign they are planning to be around for the long haul. Cryptopia says they’re hiring more support staff to handle the increasing number of users on its platform. This is a pro because they attributed some of the problems they’ve had in providing customer support to a staff shortage. Trading is all cryptocurrency driven, so there aren’t any USD pairs or other fiat money trading pairs. High deposit fees. One user explained having sent nearly 3.5 ETH to Cryptopia and being charged USD 500 for the deposit. The same user had a stuck withdrawal for IQT and even after two weeks of submitting a support ticket received no response. Major delays have been known to occur on the Cryptopia exchange. Withdrawals can be delayed anywhere from 30 hours to more than 30 days. The issue typically surrounds a coin’s wallet and when the digital wallet goes down, they must manage the transactions manually. Flawed ticketing system for customer support, which the help center is also tasked with addressing. Cryptopia promotes 2FA, which is an added layer of security protection to guard the account in the event a hacker knows the password. They recommend dynamic codes such as those offered by Google and Cryptopia authenticators. As a result, users get a new code with each and every account log-in. The Google Authenticator is a mobile app that can be linked to a Cryptopia account. They have other options as well, including emailing codes and security questions. If you’re going to trade on the Cryptopia exchange, do so at your own risk. This trading platform is riddled with issues not to mention reports of high fees in comparison to most small exchanges. Traders who are on the platform should remain on their guard, as this site is a frequent target of phishing scams and other attacks. While the CEO has pledged to resolve the customer service issues, this undoubtedly will take time. Investors may be better off avoiding this platform until they have the technology infrastructure, staff and support in place to handle the demand. If you are going to trade on Cryptopia, you may be better off sticking to the most widely used coins, such as ETH, BTC, LTC and DOGE, which the exchange says are transacting properly. The problem is one of the key reasons traders flock to the Cryptopia exchange is for access to some of the lesser known coins that other exchanges don’t support. It’s a vicious cycle. The Cryptopia exchange has both a public and private API. Users have complained about delays surrounding adding Cryptopia API to Coinigy. There doesn’t appear to be an official Cryptopia trading app.